More flickr Frock by Fridays™! LOVE THEM! "I'm so pleased with my new dress! I got compliments without anyone knowing I MADE it!! I plan on doing variations of this more than once. Ha, just don't look too close! " "I experienced the same thing! Everyone just plain didn't notice my mistakes and complimented anyway, oblivious to the fact that I made it. I also plan on making variations. 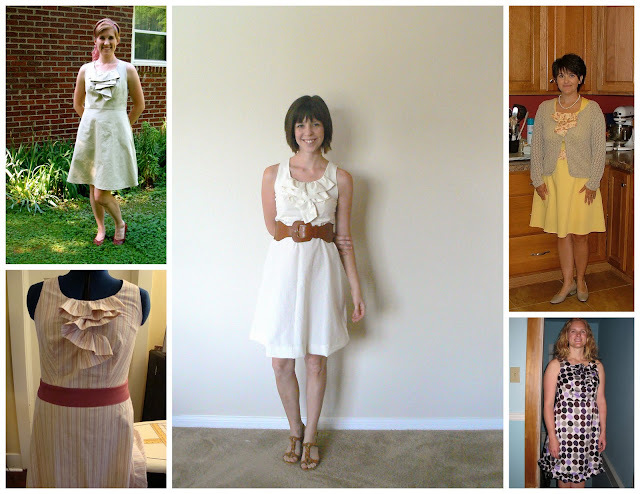 It's nice feeling having a bodice pattern that fits me; I feel much more free to vary the neckline/skirt now, rather than having to start from scratch." Thanks so much for including my frock! I have a quick question for you about adding a sash. Did you attach your sash above the waist seam or does it fold down below the seam? Or does it even matter? Thanks again Kathleen! I love that white frock with the brown belt! So chic! These dresses are adorable, guys. Great job on fitting all of them! dang it! I started late and am still trying to get my stupid zipper put in right (I know how to do it, it just doesn't line up in the back.... grrr. I need to finish so I can show it to you, it's looking pretty great! Jenny, I folded my sash above the line because I liked the way it looked better on my body that way. YAY! Thanks for including my frock (The striped one still on the dressform). It was so fun to follow along and make! I do hope you host another sew-along, it is so modivating! okay, no excuses now. If all of ya'll can do this dress, I can to! You totally can Ruhammie! None of the days are overwhelming at all! You can do it, Susannah! I love the dresses - they look amazing. Aaah I've made a couple of these in the past... great pattern and great blog by the way... You probably already know that, but praise never hurts right??! I finally posted the finished dress! I had so much fun sewing along! I printed this pattern almost a year ago (yikes!!) and it's been tucked away waiting for me to finally work up the courage to make! My biggest issue (aside from fear of sewing anything other than a tote) is I'm bigger than the largest size in the pattern and I don't know how to make it larger. Do you have any suggestions? I read through all of the comments from each days to see if anyone else had the same issue, but no luck... Being a beginner, I'm really stuck!